So the old tradition says that you should save the top tier of your wedding cake and eat it on your first anniversary. Well if you don't wrap and freeze it correctly it could potentially be pretty gross. Here's an idea - While you jet off for your honeymoon have your mom or maid of honor cut the saved cake into 12 individual pieces. Wrap each piece in clear wrap, then in foil, then place in the freezer. 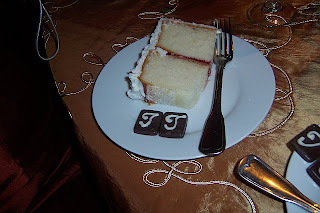 This way you can enjoy a bit of your wedding, a slice of the cake every month on the date of your wedding. What a way to celebrate every month in your first year of marriage. Great tip! I haven't been to keen on freezing the entire top layer and then diggin' into freezer burned cake one year later. I like your idea MUCH better! Thanks!